I’m hosting Louise Lyons on my LJ today. Louise is sharing an excerpt from her new release Beyond the Scars. There’s also a rafflecopter giveaway. I’m blogging at Charlie Cochet’s Purple Rose Teahouse today about Family and Reflection and what happens next, not just for the characters in The Sleepless City but in my own writing. I’m hosting J. Scott Coatsworth on my LJ today. Scott’s blogging about his new release The Homecoming and sharing an excerpt. I’m hosting Roan Parrish on my LJ today. Roan’s blogging about her new release In The Middle of Somewhere and sharing an excerpt. I’m blogging at Susan Laine‘s today about soul bounds and my new release Family and Reflection. 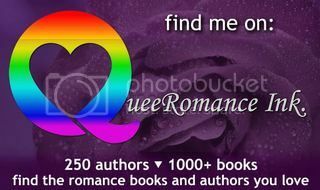 I’m interviewing Serena Yates on my LJ as part of her tour with Creative Minds Promotions for her new release The Baker. There’s also a rafflecopter giveaway.